Customers will notice the high-quality look and feel of your custom euro tote paper bags when they carry them out of the store. These bags provide a high-end look while providing premier strength and durability. Euro totes paper bags can be reused many times by the end user to ensure that your investment provides further marketing reach for your brand. A branded shopping bag can be a fashion statement, a status symbol, and a social media trend, making them much more valuable than just being a shopper for purchased items. Printing: quality printed Euro tote bags are not only colorful and stylish carrier bags,but also as promotional tool to advertise business information.Shopping Bags Mart can print any color of custom logo and full color of custom photographic design in Euro tote paper bags for your branding and marketing. Size: At Shopping Bags Mart all Eurotote Paper Bags are customized coming in any size and shape--from mini bag,small bags,medium bag,to large bag,extra large bag, from square shape,rectangle shape to trapezoid shape. Custom Printed Eurotote Bag,it is made of 157g art paper with matt lamination,custom logo printed on both sides of bag,rope handle knotted at turn top with reinforced paper board. Custom Made Euro Tote Paper Bags With Full Color Printing.This bag is made of 157g art paper with matt lamination,rope handle knotted at top turn with reinforced paper board,cmyk full color printing. Die Cut Handle Euro Tote Bags,This bag is made of 200g art paper with matt lamination,cmyk full color printing,die cut handle. 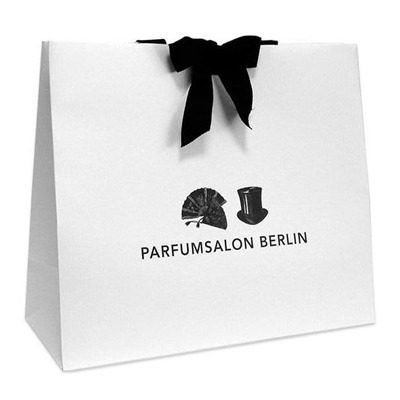 Laminated Euro Tote Paper Bags With Printed Logo And Ribbon Handle From Shopping Bags Mart. This is laminated paper bag, it is mad eof 210g card paper for strong construction,with matt lamination,black color printing for custom logo on both sides of bag,euro style with turn top and reinforced paper board at top and bottom,ribbon handle slotted into top of bag with ribon closure.